Last night was the party, and boy oh boy, I had a great time! Thanks to all of the people who came, it really showed me how many people really care about me. It's so sad to think I won't see some of those amazing people for a year! But I'm so lucky to know the kind of people I have thinking about me, and after a year, to come home to. The day started pretty slow, Whitney, my long lost friend, arrived. Thanks to my mom I got to share my time with her, which was great. We just messed around the house, getting this and that ready, and around 330 my cousin Jamie and her husband and 3 kids came! I couldn't believe it! So the party started a little early, but it was wonderful! Then around 7:30 more and more people arrived! I was all over the place, trying to be a good host and answer all the questions everybody asked me, but I probably skipped a few people here and there. Today I was WAY too tired and yes, a little hung over, to go to Worlds of Fun. So I left that to my family and stayed home to sleep and clean up what I can. Mom, the amazing mom, already has cleaned up the outside! Could I be any luckier!? This week I will spend being with my friends and family as much as I can. I just can't believe I have to say good bye this week. REALLY say good bye, to my mom and dad, Emma and Tanner, my sisters and brothers. I almost want to just...skip it and disppear! With all my sadness and nervousness, I HAVE to remember how excited I am too. I get to spend a year in an amazing country and especially be close to my amazing and most of all, supportive, boyfriend. Make new friends and meet new people. I'm going on the journey of a lifetime! But I have to get over the anxiety and remember all the good stuff there is to come! Next time I write, I bet my emotions will be flying high! 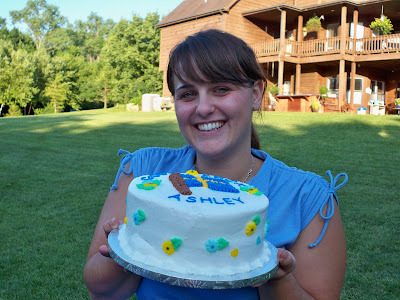 Not the best picture of me ever taken, but the cake is amazingly cute! I was sad to cut through it! But it was just as delicious as it was pretty! I can't wait to read your blog posts from Sweden! Best of Luck and have a great time!